I love decorating for Christmas, don’t you?! 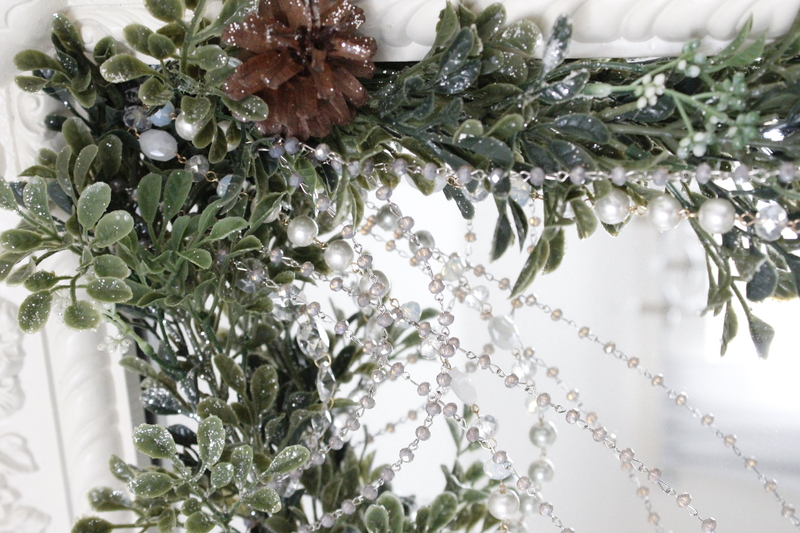 I love seeing our holiday decor everywhere I turn, in every area of our home. I didn’t put up a tree in any of our bedrooms this year but come and see what festive touches I added! I’m going to share the Christmas bedroom decor in Brooklyn’s room and in our Master Bedroom that I added. Our son only has a mini faux tree without ornaments. That’s all he wanted and that’s all we wanted him to have for now because it is so FULL of Lego Star Wars Ships and there’s no room for anything else, ha! Let’s start in Brooklyn’s room…. As we moved from Vegas back to Texas this year, Brooklyn had turned 10 and wanted a Tween Girl Bedroom Makeover. I agreed to it. I wanted us to do it together and I let her take the lead. The end result was a fabulous room that we all like to spend time in. Recently, my friends at Wayfair asked to interview me and ask me some questions about our room makeover process. The published article can be found below and I would love for you to hop on over and read my advice, along with some other designers, about kids bedroom makeovers. Especially if you’re about to target that kind of a project, I think you’ll really find that helpful. 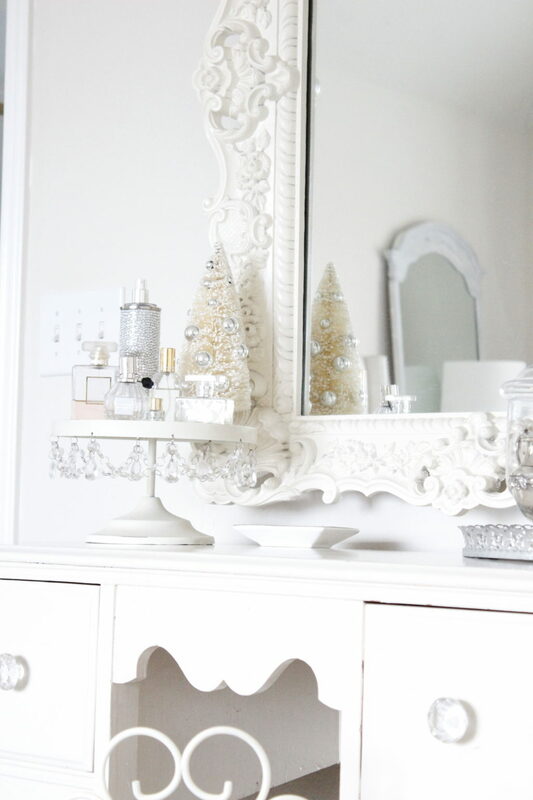 Back to Brooklyn’s Christmas room….. 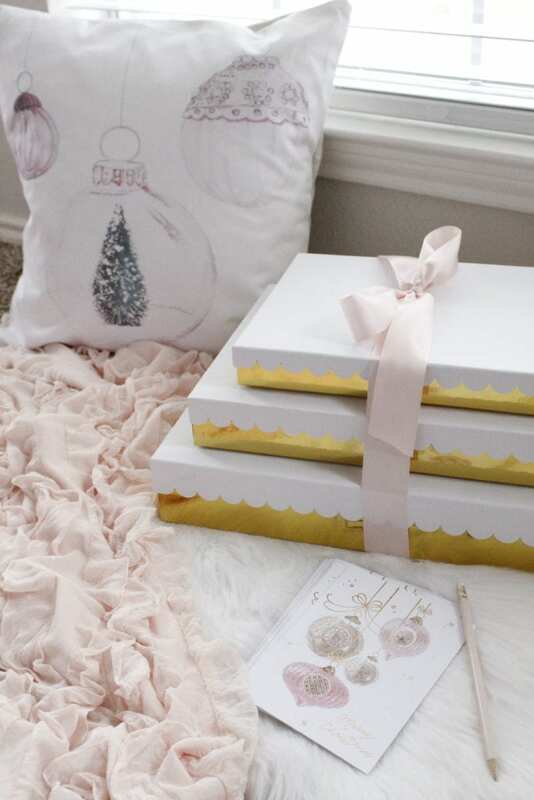 I found the most adorable blush throw pillow with a gold sequin deer at Michael’s Craft Store this Christmas. 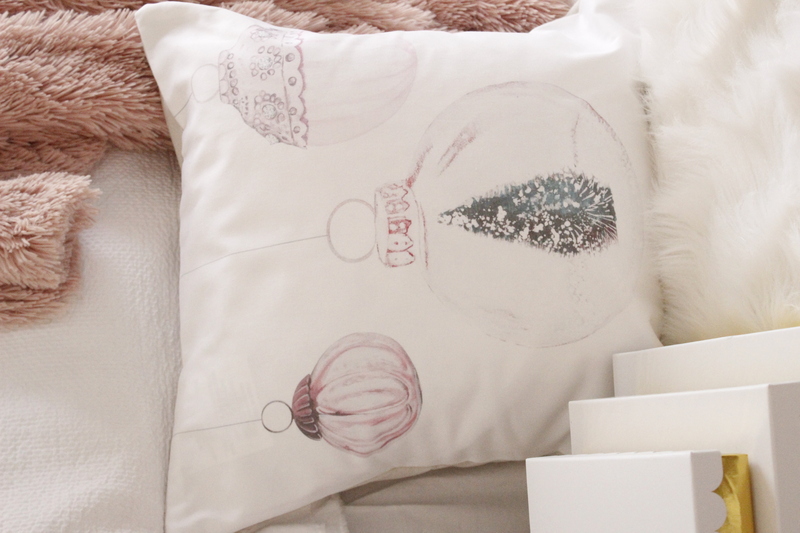 So we replaced her other solid square blush throw pillow for this fun and festive one. We kept the round throw pillow and the gold sequin bow pillow. 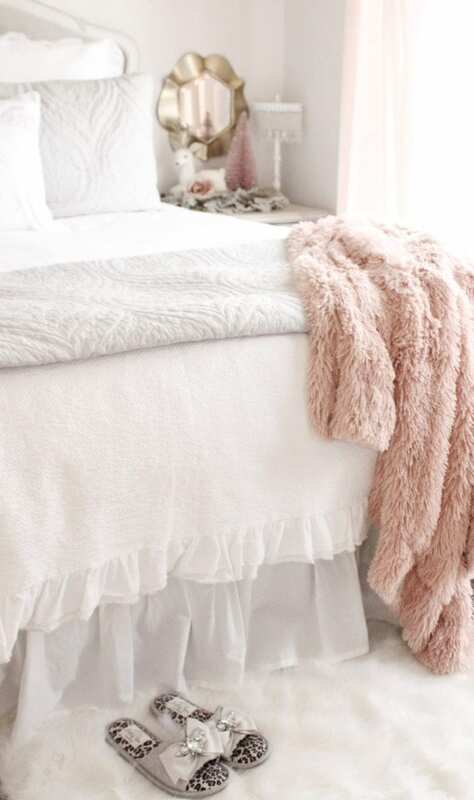 I bought this lovely blush faux fur throw this fall and swapped out the blush ruffle throw blanket for this one, as it’s a little more cozy and perfect for cold nights. Adding a faux fur rug also adds that extra touch of coziness this time of year. 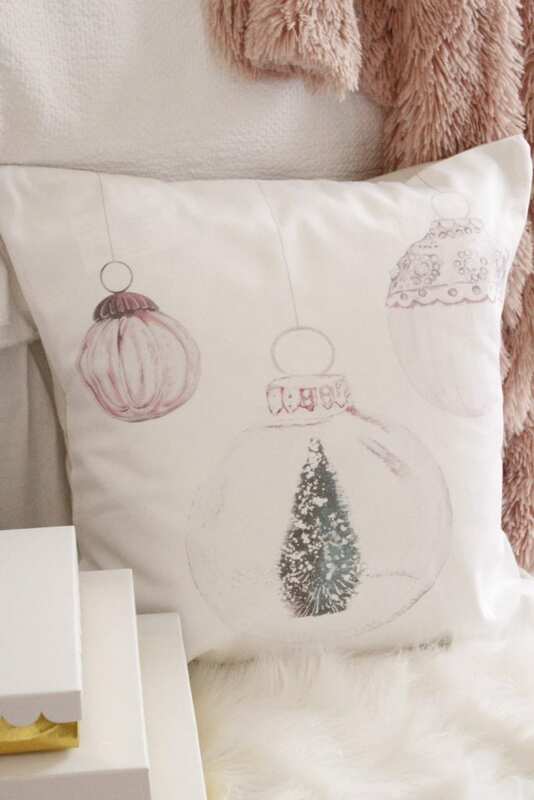 This week I received the most darling blush ornaments pillow from Jolie Marche and fully intended to put it on Brooklyn’s bed. However, she’s had this thing lately for hanging out with her friends on her bedroom floor (and bed) with her friends on a faux fur rug or throw blanket and play, talk, draw, and listen to music. 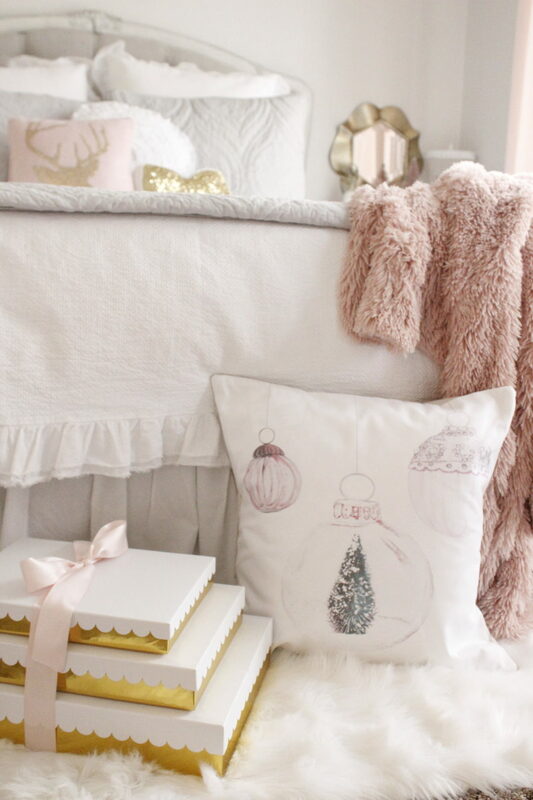 We thought it would be more fun to create a “cozy spot” with this adorable pillow at the foot of her bed. Ideally, I’d put a bench or stools at the end of her bed but her vanity is just across from her bed and not far so I didn’t want it to be too tight of a squeeze. But perfect for this cozy spot. And then…. I walked in recently and found that she actually put away all her American Girl Doll “stuff” from the bay windows and she relocated her “cozy spot”. Brooklyn changes things around as much as I do, ha! Like mother, like daughter! 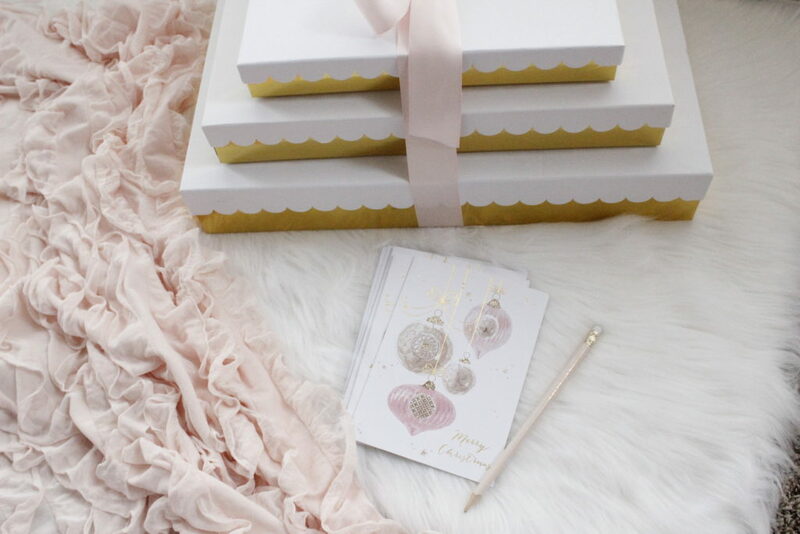 I’m sure I’m not the only one who fell in love with Sugar Paper L.A.’s gift wrapping this Christmas season at Target. Am I right? I bought a TON of it. Each room is adorned with these pretty packages. I chose a soft blush ribbon from Michael’s for these gold and white presents and it goes perfectly. You can find this blush ruffle throw blanket HERE in other colors as well in my online shoppe. How cute is this sweet 10 year-old girl of mine? She’s even placed pretty Christmas cards here, which she later wrote in and gave to her school teachers. I found those at Home Goods last year after Christmas and bought several boxes of them. I’ll probably keep one to frame and use as another piece of decor next Christmas. 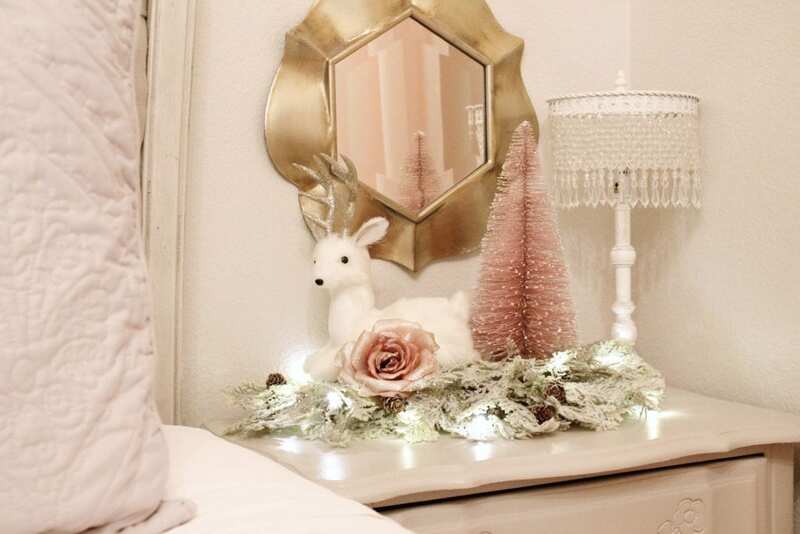 At night, instead of turning on the lights of a Christmas Tree, I made this little deer scene and added lights to put on her nightstand. I bought it all at Michaels. 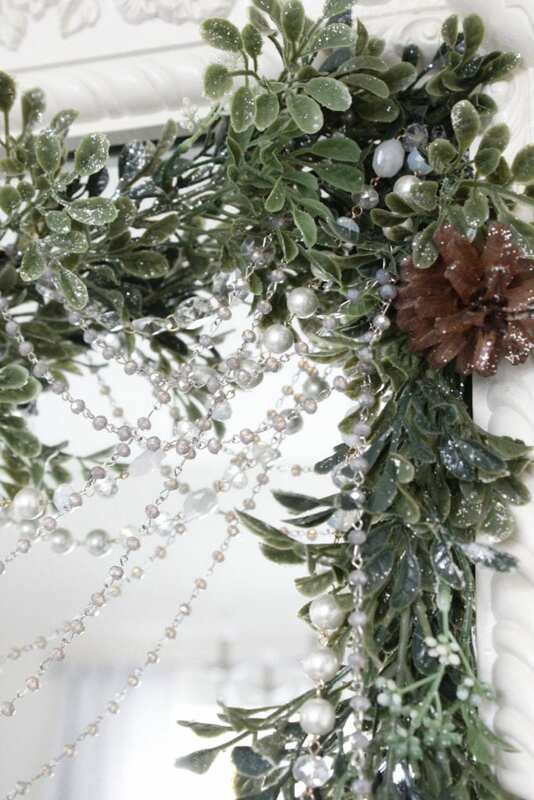 I started with a rectangular floral foam and stuck frosted cypress stems all around it. I hot-glued the deer on top and also the blush bottlebrush tree. I grabbed another one of the blush rose Christmas stems that I used on my Living Room Christmas Tree and stuck it in there as well. 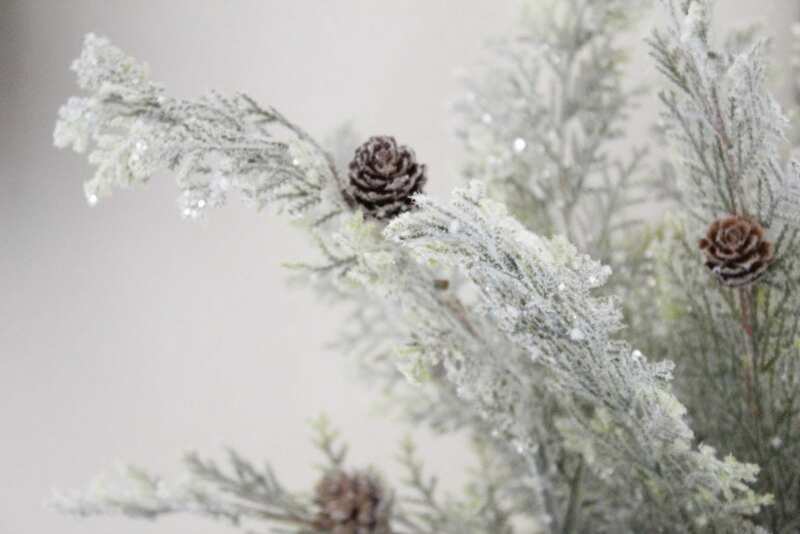 With one small LED strand of lights (battery-operated) placed and woven throughout the stems, it makes the prettiest little wintery scene for decor in Brooklyn’s room. 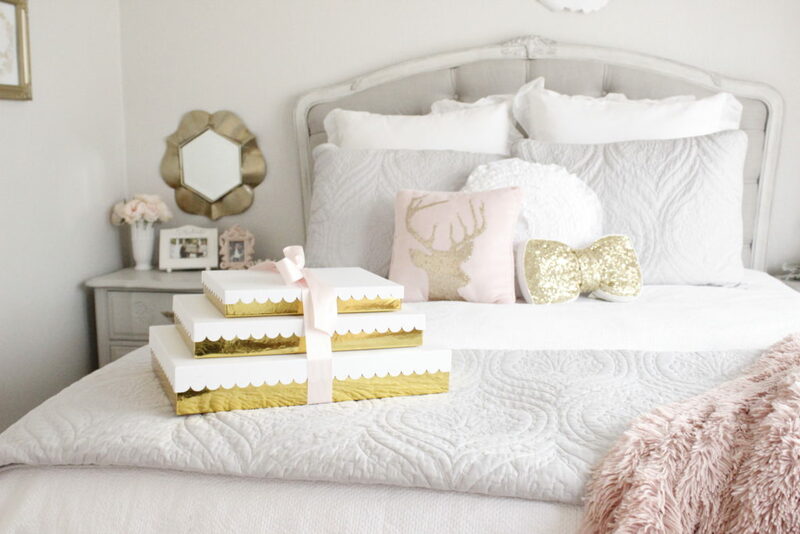 Let’s head over to my master bedroom…. I only added 2 small touches of Christmas decor to my room. 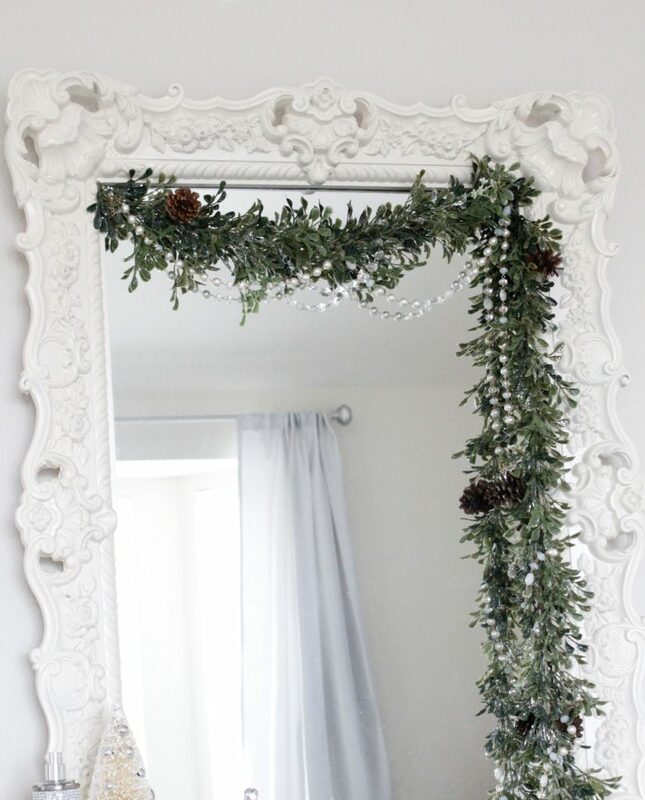 I was so busy and out of energy after getting the rest of the house done that I decided (even though I have huge bay windows and plenty of room for a beautiful tree….next year) to create a pretty swag of greenery to my vanity mirror. I used those 3M clear small hooks and put 2 on top corners of my mirror. 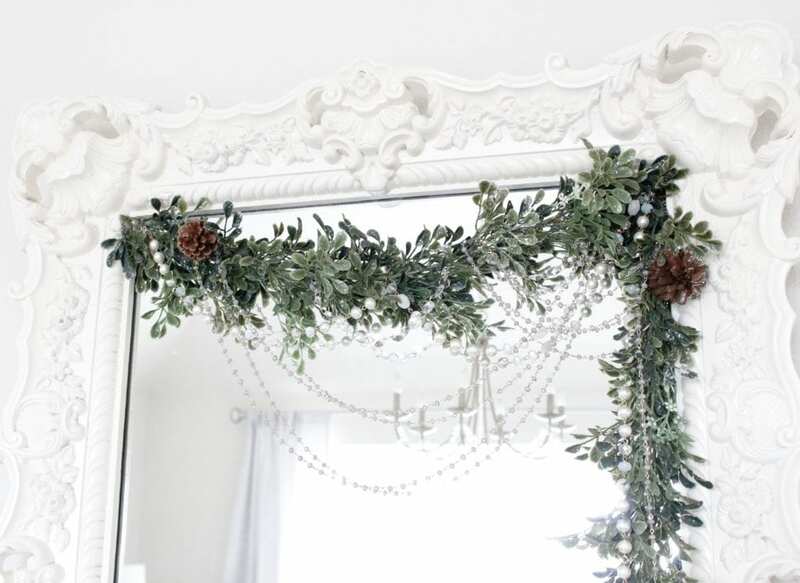 I placed the garland on the hooks and draped it down the right side of my mirror. I got creative and, because I have a LOT of jewelry and strands upon strands of pearls and beaded necklaces, used jump rings to drape and attach a couple of long necklaces. …and then let the rest of another section just hang down, along with the pearl strand. I think it’s the perfect touch for a pretty vanity. I included a pretty bottlebrush tree next to my perfume as well. 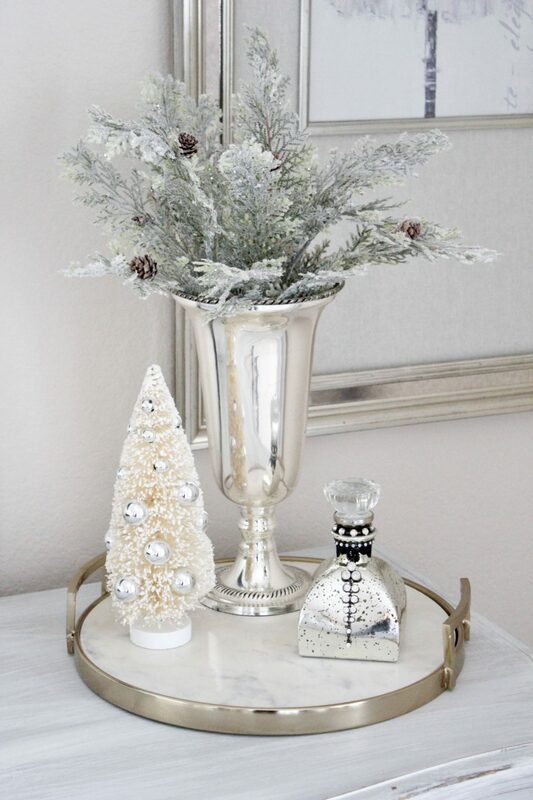 On the other side of the room on the end of my dresser, I added a simple but elegant touch of frosted sparkly cypress stems in a tall silver-plated vase. I set them on a tray with another bottlebrush tree and a pretty bottle. Aren’t these stems lovely?! They’re the same ones I used on Brooklyn’s wintery scene above and found them at Michael’s. While I didn’t do anything grandiose in either of these two rooms, it was enough to bring that feel of Christmas that I love so much. Don’t feel like you have to do all viagra feminin effet gold max or nothing. 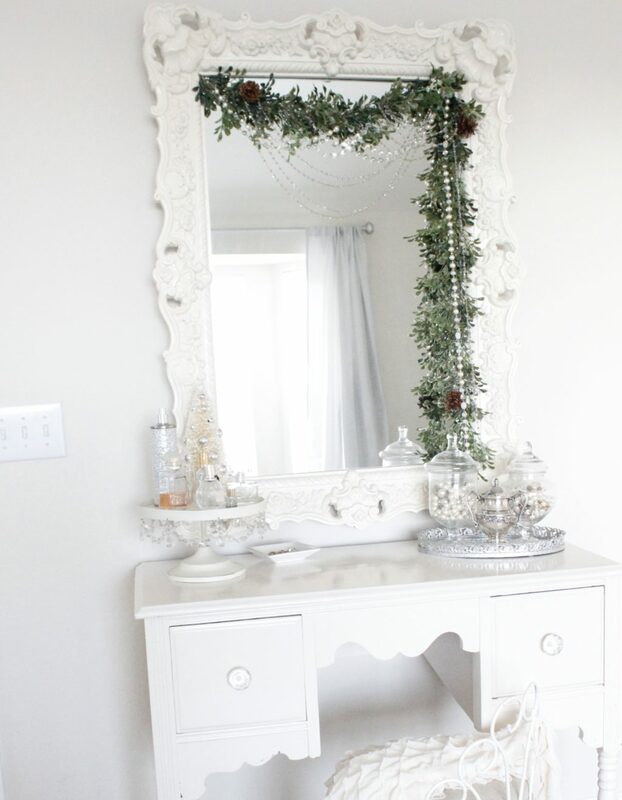 Simple decor can still be lovely and festive. I’m included these items I’ve used, or similar, for your shopping convenience. 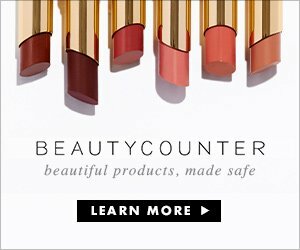 Enjoy shopping below! Wishing you the Merriest Christmas & Happiest New Year!